Paint and ink have, so often, been used to conceal, dissimulate or persuade that one is almost jarred by the power of naked insight shown in the major retrospective, 'Degas: Master of French Art', at Canberra's NGA. Degas is paradoxical in today's art world for, as we have fetishised an artist's milieu, personality and anecdotes, here is a painter who appeared to capture the most spontaneous and unguarded moments through endless and painstaking craft, a seeming anti-semite and misogynist who shows his respect for people through his realism. Degas is a little complex for critics today, although tellingly popular. The NGA's show is not encyclopedic, Degas was prolific and it's a testament to the quality here that without works like the Hermitage's 'Place de la Concorde' or the London National Gallery's 'Miss LaLa' the exhibition is still formidable. The structure begins chronologically, opening with the sulky insolent self-portrait from 1857, where we meet his gaze for the first time. Bold yet oblique that gaze was Degas' most formidable tool, he understood how vision, how we look at things, how the most important things aren't seen at the most obvious angle and how the eye is democratic if it is truthful. In the recent times we have fetishised the idea of spontaneity in art, the smaller the distance and time between subject, painter and painting the supposedly greater its veracity. This tendency can be directly attributed to the Impressionists and their 'en plein air' approach, the archetype for the 'natural' artist as romantic hero. No one paints more vitally than Degas, in 'The Racecourse (Amateur jockeys close to the carriage)' he creates plane after plane of action that almost bulge out from the plane of the picture, a cropped carriage, a cut off horse fighting its rider for control and a top hatted gent who has to force himself into the bottom corner of the picture are immediately suggestive of how we experience a crowded race meet, a blur of stimulus our brains chase to keep up with. Of course the pay-off here is that the canvas, begun in 1876 was only finished eleven years later. No one cold ever accuse Degas of haste. 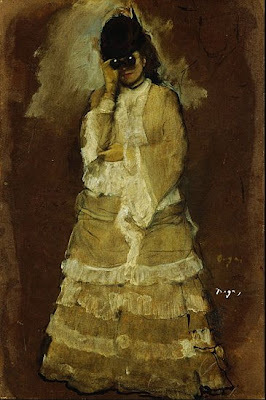 But this is what ought to make Degas great for us, he does not ask for his work to be judged on the circumstances of its making or the biography of its maker, he simply seeks to use his skill to show on canvas how the real world looks and makes us feel. I think there can be few higher aims in art. The breadth of work, if primarily limited to horse racing, the theatre, women at work (three of the 'themes' by which the work is arranged) and portraiture, is dizzying. The oil paintings that are meticulous in their Velazquez like economy of effect, pastels that shimmer like daylight and the inky spontaneity of his monoprints show how Degas strove to match medium with affect. Perhaps the most striking room is called 'Painterly Prints', composed of a significant sample of the monotypes where he demonstrated not only his spontaneity but an almost prescient eye for images that appear journalistic. The process of monotyping requires that an artist work fast, whilst ink remains wet, and the sweeps and strokes recorded on paper are incredibly evocative of motion, light and atmosphere. As striking are the seemingly haphazard compositions, irregular and asymetric, they are oddly cropped and sometimes the subjects are almost missed out of the picture or are a mere rumour in the inky dark. This 'photographic' (and let us remember that Degas achieved these effects when photography was still overwhelmingly static and posed) are of course part of the character of Degas art, but in the blacks, greys and occasional startling gaslit whites of the monotypes we feel that we are looking at images captured urgent and true. Degas command of the temporal, the captured moment whose significance is not always immediately obvious even to it participants comes back to his gaze. What the eye just sees the mind spins stories around, and for each lurking silhouetted top hat or glance out of the frame of the painting we seek to assign significance. 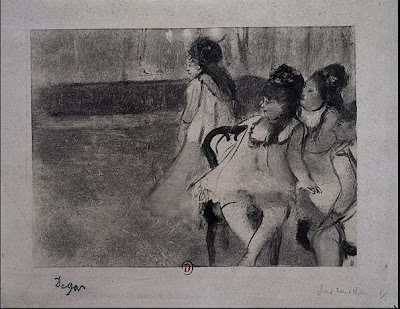 This is part of Degas fascination, his narrative is compelling because it is almost always implied. 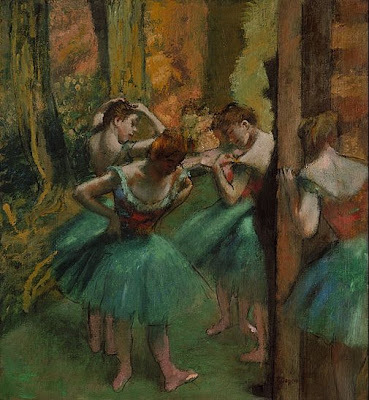 Whilst Degas was obviously consumed by the theatre and ballet he presents it to as not so much as spectacle than as microcosm. We, the viewer, find ourselves backstage or in the wings, were we paying customers we would demand discounts because our sight lines are often obscured. Even Degas' subjects are unsure where the spectacle is, in 'Ballet de 'Robert le Diable'' the member of the audience we focus on looks through opera glasses up and at a right angle to the plane of the stage, all human life is not to be seen there. Clearly the play is not the thing, Degas shows us the innards, the boredom, the intrigue, the concentration and the distraction. The accumulated message we hear might be 'if you look hard enough you will see behind this facade'. It would be perverse not to mention 'Little dancer aged fourteen' as here it is set in the final room, spotlit in darkness and raised on a plinth. What makes it extraordinary is that, despite this treatment she still retains a mix of vulnerability and snotty insolence. The scale of the model is perfect, perhaps a little smaller than life size as such she demands our attention directly rather than becoming monumental or trivial. The imperfections that mark Degas' making of her make her all the more affecting and perhaps this is why, as eerily familiar an image as she is, she never becomes banal. 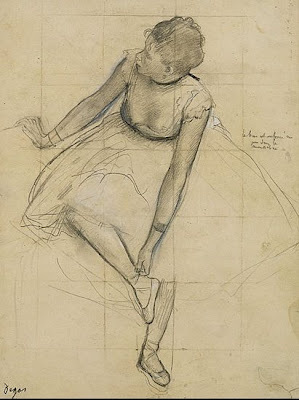 Like so much else of Degas' work she appear poised to step out into our space as she has our consciousness. Degas is one of the great painters of women. We may question his relationship with them and their economic and social position at the time but it is women he gives the greatest compliment to, that of veracity. His prostitutes exchange glances that speak volumes of the men they wait to serve, nudes are fleshy and honest in their self-posession and laundresses are afforded concentration, skill and composure. 'Woman Ironing (Blanchiseusse repassant)' is sharp and radical in its construction, reds and gauzy whites give the space an almost palpable humidity yet within it the veiled and bare armed the laundress is dignified in her composure. We appear to glimpse women as best we can, they do not give themselves up to our view easily, even 'Mary Cassatt in the Louvre' will not deign to turn toward us. Degas may not be the nicest painter of women, but he is an honest one. If we find ourselves moved to pity, contempt or arousal it is not because the artist has loaded in contrived affect, it is because he has striven to find a moment and an image that is the most naked and humane, only that allows us to respond in such a directly emotional way. The triumph of Degas is that he made art of a belief that each individual deserves not to be idealised or made gorgeous or noble but that the most beautiful is the most honest. I think he shows that only by looking we might we understand, and that is why he still has the power to connect us with human truths and uncertainties today.